Share your passion for pugs and save 10 percent on your online check order! The world has gone pug crazy! And who can blame all of those pug owners who have been captivated by the pensive faces of the pug dog breed. If you're one of those smitten by the pugs, then share your passions for pugs every time your write a personal check. No, it's not expensive. Checks on Sale has several adorable and AFFORDABLE personal pug check options. There is a 10% discount on all orders of $10 or more. In addition to personal pug checks, you can also purchase companion mailing labels. So you won't even have to write a check to show the world how pug crazy you are! Value checkbook covers are available for only 99 cents. 10% Off All Orders of $10 or More! CLICK HERE to see all the dog breed personal checks at Checks on Sale. If the antics of pugs keep you laughing then share that with the Laughing Out Loud check series. The bold captions of YIPE, WOOF, BARK, AND FONZIE highlight the hilarious pug photos. Your personal check certainly tell the world a great deal about you. When you use these pug checks, I guarantee the world will smile with you. Every pug owner knows how entertaining their pets can be. The incredulous faces of pugs in the checks below show you that infamous pug wide-eyed innocence that belies any admission of guilt, no matter how strong the evidence. When you shop at Girly Checks, there are no coupon codes to remember, you just save $10 on all check orders of $10 or more. It's that simple. 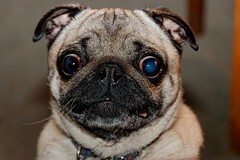 Online personal checks that capture the spirited side of pugs. After a busy day of roughhousing at pug play dates and entertaining their human family members with their adorable attitude, the most energetic pug needs some rest! Personal check ordering for pug lovers. Address labels are one of those things that most of us don't give much thought to. We just address the envelope and scribble our return address. I admit it, that's what I do. But I do notice when the mail I receive comes with attractive and thoughtful return address labels. I'm seriously considering giving dog breed address labels as host gifts next Christmas. It's hard to give personal checks as gifts, because of the confidential bank information required. But if you know your gift recipient's mailing address, you're good to go for address labels. All of the members of my family have dogs of one kind or another. Dog breed return address labels will be the perfect stocking stuffer. If you're like my family and like to give practical gifts with a bit of humor attached, then dog breed address labels might be for you as well! Girly Checks has personal checks for most dog breeds. Just follow this link. Girly Girl Dog Breed Personal Checks to see them.